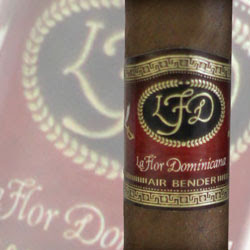 I am a big fan of the La Flor Dominicana line. I remember when the Chisel first came out. I smoked Chisel after Chisel. It was the same way when the Air Bender Chisel was first released last year. I just about smoked myself silly, they were so spicy and delicious, I couldn't get enough. Well it has been a few months since I smoked an Air Bender Chisel and I was looking to do a blog on a cigar and I saw the Air Bender Chisels on the shelf. They were just begging to be smoked. Upon lighting it up I knew I had made a sound decision. It was sweet and spicy and full of power. The Air Bender line is excellent, and the Air Bender Chisel is one of my favorite cigars. If you like full bodied cigars these are a must try. Tony Gomez in the house!